Researchers at the University of Waterloo have been able to capture the first composite image of a dark matter bridge that connects galaxies together. The scientists publish their work in a new paper in Monthly Notices of the Royal Astronomical Society. Dark matter, a mysterious substance that comprises around 25 per cent of the universe, doesn't shine, absorb or reflect light, which has traditionally made it largely undetectable, except through gravity. "For decades, researchers have been predicting the existence of dark-matter filaments between galaxies that act like a web-like superstructure connecting galaxies together," said Mike Hudson, a professor of astronomy at the University of Waterloo. "This image moves us beyond predictions to something we can see and measure." As part of their research, Hudson and co-author Seth Epps, a master's student at the University of Waterloo at the time, used a technique called weak gravitational lensing, an effect that causes the images of distant galaxies to warp slightly under the influence of an unseen mass such as a planet, a black hole, or in this case, dark matter. The effect was measured in images from a multi-year sky survey at the Canada-France-Hawaii Telescope. I don't see any way to account for such an observation with any sort of modified gravity theory. At least, not with a modified gravity theory that isn't very weird. Maybe dark matter is the simpler hypothesis. Re: "For decades, researchers have been predicting the existence of dark-matter filaments between galaxies that act like a web-like superstructure connecting galaxies together"
Imagine my dismay when I found that the paper cited does not even apparently cite a single source for this decades of "prediction". Can anybody point me to these predictions? How did you "make" an image that isn't there...? didn't read the article did you, chum? 'cause it's plain as day what they imaged. For this much lensing to occur there must be THIS much mass. Mass that apparently doesn't interact with photons or matter (hence the DARK park), but does interact with space-time..
For this much lensing to occur there must be THIS much mass. Mass that apparently doesn't interact with photons or matter (hence the DARK park), but does interact with space-time, making it visible for those with eyes to see..
That magnetic fields affect light is PROVEN every day in countless ways, "gravity bends light" is a hypothesis....given the presence of galactic magnetic fields...a painfully weak one. - The bending of light by gravity was first observed by Eddington in 1919 (e.g. https://www.earth...lativity ) - the first observation to confirm the predictions of General Relativity. The observation has been experimentally confirmed literally hundreds of times. - On the other hand, magnetic fields do NOT bend light and certainly could not produce the gravitational lensing effects described in the paper. I defy you to provide a single reference suggesting how they could. any multiple exposure picture is "made"
would you contest the following under the same argument? random online reference -- average magnetic field strengths of galxies ( spiral ) about 0.1 nano Tesla. Your finger has a stronger magnetic field. Your cell phone has a stronger magnetic field. Earth has a stronger magnetic field than the average galaxy. 2) photons are neutral, meaning magnetic fields don't effect them. 3) -but what about changing magnetic fields cause those create EM waves and that effects photons -- right? No, or the effect is so small it doesn't matter... radios would not work on Earth. Does anybody know where this prediction originated? Where was it first published? There is no citation offered for any of the claims of the first paragraph. Does anybody know where this prediction originated? Where was it first published? I can not comment on the first theoretical work that referred to DM filaments, but the introduction of the paper DOES give a VERY comprehensive reference for these predictions ( https://arxiv.org...6665.pdf ). Did you miss it? Or did you actually not look at it? Besides, all you have to do is look at maps produced by models such as the Millennium Simulation ( https://wwwmpa.mp...lennium/ ) to see that the models predict low density DM filaments connecting almost ALL neighboring high mass aggregations (i.e. galaxy clusters). Re: "Did you miss it? Or did you actually not look at it?" This paper does not help me to identify if this is a prediction or postdiction. "The suggestion that the universe be filamentary and cellular was generally disregarded until the 1980s, when a series of unexpected observations showed filamentary structure on the Galactic, intergalactic, and supergalactic scale." "Discovery of structures larger than superclusters began in the late-1980s." The prediction followed the observation. so where is the predictability of the eu cult ?? and why are you ignoring that they have zero predictability and the bulk of their claims are "postdiction" events that aren't even correct 90% of the time? the eu is the very definition of the "texas sharpshooter" fallacy, so why aren't you publicizing that? here is the problem we have with your "collection of evidence"
Re: "my link provided all the information you needed"
(1) None of the dates in the search you've posted predate the 80's. So, how can any of them "predict" the filamentary structure of the large-scale universe, which was not observed until the 80's? (2) I'm betting that a number of you here already know that dark matter filaments were post-dicted, based upon observations, and yet there is nobody pointing out the sloppy journalism -- leaving those who do NOT know this to assume the validity of it. "Hence medium-density plasmas (and perhaps also low-density plasmas) seem very often to be strongly inhomogeneous, exhibiting a filamentary structure which often may be parallel to the magnetic field." i took a whopping 4 seconds to refute your filamentary claim, so now you want to push the goal posts? so what's your next goalpost movement? you mean like 1977 or 1979, per your constrained dates? You provided a link to 1 480 000 articles containing the words "Dark Matter" in the title. Did you expect him to read every one or were you going to point out the one you had in mind? where is that scientific evidence you said i would see this year? is it approved by the FDA yet? Skepticism which is specifically directed outwards is simply a form of ideology. It is on occasion -- properly -- called pseudo-skepticism because it is not in the spirit of protecting yourself from misleading or malformed claims (which of course can come from any ideology). It should be apparent that to the extent that nobody here actually cares about the meaning of terms like "prediction", it opens the door for historical revisionism. To those who have a basic idea of the history, they already know the importance of the concept of homogeneity to the Big Bang premise. Dark matter filamentation was only proposed once large-scale filaments were observed. The paper which the author cites does not actually use this term "predict". The science journalist has taken it upon themselves to use that term, and if it is to retain some sort of meaning, we should all reject his usage of it. would you prefer the 2,370 results be listed in the above paper as a "reference"? What we could really use is a video of this dark matter. A still image helps no one understand anything. you're saying we need a video that can track the movements of dark matter? sure... lets just run out and get some footage! As with every finding, sighting, picture or other constructed claim of seeing dark matter, the construction is formed by a computer based on gravitational lensing. Yes, there is gravitational lensing of light. Such lensing is evidence of gravity, it is not evidence and certainly not proof of invisible matter. Image looks legit. The soul of dark matter is being uncloaked. "Yes, there is gravitational lensing of light. Such lensing is evidence of gravity, it is not evidence and certainly not proof of invisible matter." Imagine if you had those eyes. it's all fake, the astro-boys know that it is just plasma. Something is causing gravitational lensing in an area where there is no visible bright matter. The location seeming to form a bridge or filament between two galaxy clusters seems inconsistent with MOND, and consistent with CDM (cred to @rogerdallas- good point). It's also consistent with filamentarian CDM cosmological models. Whether it's "first" or not is somewhat questionable as @Dingbone has pointed out; but whether it's there or not is pretty clear given lensed images of background galaxies. As for "theories" of lensing due to electromagnetic fields, this is risible given that photons are uncharged. More EUdiocy. very cool. it would not surprise me one bit if "dark matter" come in more than one flavor. No. What they did was stack the lensing signal from 23,000 pairs. Each pair has background galaxies seen around it, those background galaxies are used to measuring the lensing but for a single pair it's very noisy so they stack the signal. Each pair is rotated and scaled so all the pairs line up on top of each other. The lensing signal is then stacked giving what you see. 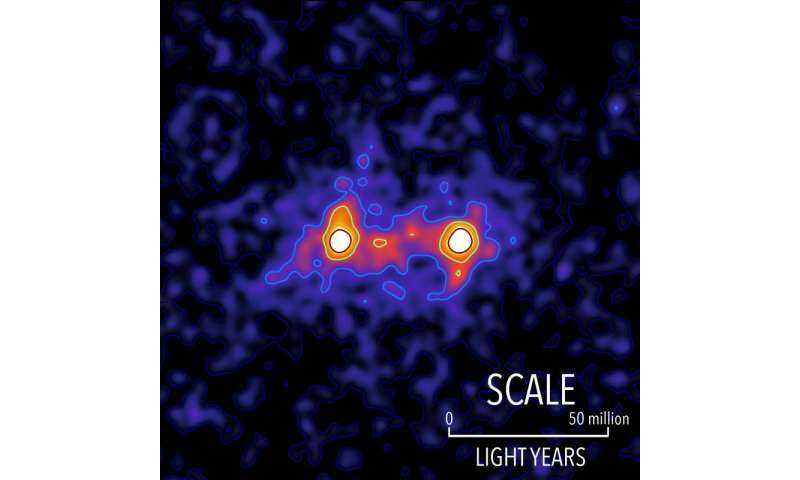 The two peaks in the image are where the first and second galaxies of each pair were stacked. It's just like stacking any astronomical image, you line up all the frames and then you stack, the only difference here is that you're stacking different objects. so tell me... where, exactly, is the wind in this picture? so, why can't you get approval for your super magneto machine? so then why can't he substantiate his claims with peer reviewed studies? so, comprehending the subject matter enough to provide relevant scientific material is not a measure of intelligence? you've never heard of validation... or maybe your magnetic cancer killer fried a few too many circuits? Why do you keep appealing to an authority as corrupt as the FDA? Milgrom acceleration not dark matter for Tully-Fisher galactic rotation versus radius. Big Bang baryogenesis' 0.61 ppb matter bias, hadrons less antihadrons versus photons re Sakharov conditions. Space has ppb chiral anisotropic background selective to hadrons. then why didn't you take your own challenge (bet)? @IMP-9, they also were able to use some parameters to characterize some pairs as "physical," that is, actually close enough to show a filament between them, and others as "non-physical," meaning they are actually too far apart to have a connecting filament because they are at different distances from us. This was important to constrain the signal-to-noise ratio by constraining the pairs to "physical" pairs. The secondary filtering applied to determine physical vs. non-physical pairs was delta z; that is, how different the redshifts were for the two galaxies in a pair. @IMP-9 (& DA Schneib if he is reading this). "Since nobody realized that before, all these supernovae were thrown in the same barrel. But if you were to look at 10 of them nearby, those 10 are going to be redder on average than a sample of 10 faraway supernovae." See the IMPORTANT implication(s), DS? If they have been doing that; and CONFUSING even NEARBY SN populations data/parameters, then HOW ON EARTH can you STILL claim it has only a MINOR import when SN data/conclusion EVEN MORE UNreliable for cosmically FAR distant SNs? See? Even mainstream is realizing ALL 'redshift' based exercises/claims are HIGHLY unreliable. Also recall, IMP-9, distant-object 'images' are 'built up' photon-by-photon. So, 'stacking' such 'images' must INCREASE 'false artifacts' likelihood. Bad. To amplify my most recent comment, I will use an analogy: double stars. Some double stars are actually close enough together to interact gravitationally; others are merely "apparent" doubles, where they are actually far apart in distance from us, but appear to be close together when looking from here (from Earth). The difference can be discerned by examining their vectors, which in turn can be determined from their spectra. In the analogous way, the vectors of the two members of a galaxy pair can be determined from their spectra. Once this is done, then two populations can be distinguished; those which share spectral characteristics (i.e. redshifts) and those which do not. When this is taken into account, it is found that the ones that share spectral characteristics have strong indications of filaments between then, and the ones that have divergent spectral characteristics do not. This can be seen in Figure 3 of the paper. As a further note, astronomers often refer to stars that appear close together in x and y (right ascension and declination) but are far separated in z (distance) as "optical doubles" and to stars that are actually close together and gravitationally bound to orbit one another as "binaries," or higher multiples if there are more than two stars so bound. @RC, not even reading it. You might as well not bother. Your impolite insinuations, constant self-aggrandizement, continuous use of FUD, and constant denigration of all others to boost your self-esteem make you impossible to have a polite conversation with. Go away. Or learn to do better. This is me rubbing the puppy's nose in it after it widdled in the corner. @RC, not even reading it. You might as well not bother. And there it is again, folks! The Stumpy Method of intentionally ignoring and missing stuff so you can blithely lie and deny it ever happened! Sad. Way to go, DS; you've just 'graduated' from the "Stump Academy for NOT BEING INFORMED or UP TO DATE". You've 'passed with Honours', DS. I just reminded of/pointed out some crucial aspects creating the problems for such exercises as these, and YOU just ignore it! Like you ignored my doing the same for the Bicep2 problems. Let's face it, DS; you are a 'hack' pretending to know things but actually just 'reading up on wiki' for the ORTHODOXY 'spiel' to regurgitate here to impress your gang friends who also 'prefer' to hear the 'comfortable blather' of OLD orthodoxy rather than listen and update yourselves on new info/insights from me AND mainstream which is increasingly FALSIFYING that OLD orthodoxy and confirming me correct all along on many fronts. Sad. @RC, again, not reading it. Doubtless another whining session. Puppies don't like having their noses rubbed in their widdle. Nobody cares. Get over it. Obvious troll is obvious. Quit trolling, @RC. The worst thing about you is that you obviously know better but can't stop yourself. It's frankly embarrassing to watch. Nobody can possibly miss it unless they are as immature as you. That you think anyone who matters does is an indication of your own immaturity. All you ever had to do was stop and take a look at how you look to yourself. It's called "introspection" and it's an important discovery that every child makes during their maturation. It's a shame that you seem never to have discovered this, but it's not my shame, nor anyone else's but your own. Any concept derived as a "fudge factor" to help maintain expansion theory's explanation of the background red shift is suspect. @RC, again, not reading it. Doubtless another whining session. Puppies don't like having their noses rubbed in their widdle. - not to mention inadequacies of 'conventional' maths. So, DS, how can anyone take you seriously and give you '5', when you 'ignore then deny' info posted for your education? You are more interested in making 'gang friends' (ie, your "Nobody cares." bot-voting gang who give you '5'), than you are in actually updating re the science NOW. So, @RC, got anything to say about the filaments or the dark matter web? I haven't even read your post and I know you don't. The visible'gravitating/lensing NORMAL matter is now being found EVERYWHERe; not only in 'filaments' but ALSO in previously MISLABELED 'voids'. Get up to date, DS. Which makes your continuing self-inflicted ignorance-in-denial state even more pitiful than ever, DS. PS: DS, it may help you to look less of a prat if you opened your eyes and read what is being posted, instead of opening your big mouth without reading what is being posted. Pitiful. Still denying SDSS and BOSS. Now you're just making stuff up, @RC, which was predictable given your history. What a complete waste of time you are. Here's a report of the actual announcement: http://www.slate....ons.html I'll note that's Phil Plait, the Bad Astronomer himself. You're lying again, @RC. You're busted again, @RC. See, this is why you're worthless, @RC. You always lie when you're backed into a corner. I only have to watch to see when someone else's post puts your back against the wall and shows you're wrong and read your response to see if you're still lying. And you always do. Every time. Like clockwork. Please show where anyone claimed there is absolutely no matter in the voids. They didn't; and instead of acknowledging that they're not and never were claimed to be absolutely empty of all matter whatsoever, you made up another lie. You're lying again, @RC. Cookie jar: on the floor broken. @RC: claiming he didn't raid the cookie jar. Give it up. You're like a 3-year-old. By the way, that's actually a pretty good article, and very apropos of the article on the guys who have worked out a new simulation regime that shows that it's the difference in expansion between the voids and the filaments that creates the effect of dark energy. I'll make sure to update that article with this paper. I'll note that's Phil Plait, the Bad Astronomer himself. Bad astronomer and a pitiful "scientist" to boot. Meaningless blather from yet another plasma ignoramus. @cantthink69, Phil's got more astronomy in his left little toe than you have in your entire body. As usual, you slander those you cannot prove wrong. Noted that you have no comment on the actual scholarly article by a real scientist and resort to slandering popular science writers who understand the scholarly article in a way you can not do and never will be able to due to your retarded state. @RC's lie about cosmic voids is now spread across three threads, and this is @Schneib making sure everyone knows it and sees it. This individual is dishonest, making up lies when confronted with evidence it cannot answer. No one who values their reputation on this site should bother interacting with this individual until it decides it will always be caught when it lies and stops lying. Only in this manner will this puppy learn not to widdle on the carpet. I say this for the good of this site. @Da Schneib. You finished? Good. Listen and learn. The new discoveries of ORDINARY matter in HUGE quantities EVERYWHERE and in all sorts of states and all sorts of scales/distributions, implies that NO 'dark Energy' OR 'exotic dark matter' are needed AT ALL to explain motions/lensings observed. Got that, DS? Moreover, any articles/exercises which a-priori ASSUME 'Exotic DM' and that 'Dark Energy' (and Inflation, Expansion and Accelerating Expansion) are from the get-go FLAWED and circuitous exercises. Just as Bicep2 was! Have you learned nothing from that fiasco, DS? Further still, the fact that the great expanses of space regions are cold and contain LOW luminosity and STILL undetectable material because our scopes are still unable to actually detect the EM signal so diffused and diffracted etc on its long journey to our present telescopes, is the reason that the 'filaments' stand out more than the so-called 'void' regions. Its circuitous assumptions/exercises, DS. Ok? @RC, no, I ain't finished until you apologize to this site for lying for self-promotion. Sniff the widdle, puppy, until you learn better. The only way to deal with a baby dog is be consistent and keep rubbing their nose in the widdle until they stop. Obviously nothing else works with you. There aren't any HUGE quantities inside cosmic voids. You're lying again, @RC. Sniff the widdle on the carpet, @RC. You did it, @RC. Don't do it any more, @RC. There it is again: so "certain" yet so ill informed re the new discovery/reviews by mainstream itself. It's self-satisfied ego-maniacs big mouths who DON'T READ up to date and who think they knew it all and nothing has changed to rock the big bang etc 'boat', who have been filling the literature with 'publish-or-perish' CRAPOLA based on nothing more than fantasy and unreal 'things' which had no tenable scientific support from the get-go! If you still in denial, you probably missed where Prof Paul Steinhardt admitted INFLATION was NEVER a scientifically tenable hypothesis, only a FANTASY based on more fantasy going back into the 'papers' assumptions/literature for DECADES! DS, remember: you were also "certain" that there were "no flux tubes or plasmoid process in the sun's dynamics"? WRONG! The new discoveries of ORDINARY matter in HUGE quantities EVERYWHERE and in all sorts of states and all sorts of scales/distributions, implies that NO 'dark Energy' OR 'exotic dark matter' are needed AT ALL to explain motions/lensings observed. Got that, DS? AGAIN, YOU LIE! There are NO such "discoveries". AGAIN, I challenge you to produce a SINGLE reference for such "HUGE quantities" of matter. Recall you need quantities of more than 500 BILLION solar masses in galaxies such as the Milky Way and hundreds of TRILLIONS of solar masses in galaxy groups or clusters. AGAIN, I tell you that you are completely deluded if you think ANY papers, recent or not, have FOUND this much previously hidden baryonic matter, and challenge you to PROVE otherwise by providing appropriate links (and not some hand-wavy "done if before" BS). So, AGAIN... Put up or shut up. @RC has one paper, and it's the one I linked: https://arxiv.org...02.01784 It doesn't understand it. It thinks that to be a "void," a cosmological void has to have absolutely no matter in it. It doesn't understand that there are bound to be a few scattered galaxies in it, nor even if it did would it understand how those galaxies probe the properties of such a void. But between the filaments and walls of this cosmic web are vast cosmic voids. There are stray galaxies here and there, but overall, these bubble-like voids are about 80 percent less dense than the cosmic average. There can even be voids within a void, producing a nested structure. So from a couple of misunderstood and poorly read popular science articles, @RC has constructed a fantasy in which dark matter is unnecessary, without even properly understanding that for these voids to exist, dark matter is required. Without understanding that for galaxy clusters of the size we see to exist in a universe as young as ours, with as little bright matter as our universe has, dark matter is unavoidable. Without understanding that for filaments linking galaxies to be seen by the gravitational lensing of background galaxies, as we see them, there must be dark matter there. If there were bright matter there we'd be able to see it. I think this is over. The facts are there. The observations are clear and well documented. The supposed evidence against it doesn't exist; it's a fantasy. You're kidding, right? Either that, or you're in denial of recorded recent mainstream astronomy/cosmology discoveries/reviews of many times the old normal matter 'estimates' previously naively, unsuspectingly based only on visible matter which our telescopes at the time were not able to 'see' beyond. Since then a series of telescope/instrument developments and less 'naive' review of new AND older data is leading to a new understanding of just how much MORE massive/extensive galaxies really are; just how MUCH more previously 'unseen' ordinary matter exists in deep space between galaxies/clusters. They are STILL finding MORE ionized material (of which the ionized Hydrogen component is an indicator of even greater amounts of material in other forms (organic compounds, dust, ices, bodies etc) and various 'energetic' states (protons, electrons, kaons, pions, quark-gluon plasma etc). So, RNP, you are working from naive models/interpretations, denying newer info. Read up. Pathetic!!!! NO references. Just more unsubstantiated claims and obfuscation. Sooner or later you are going to have to realize that every rational person following your posts KNOWS that you are a fraud because you refuse to provide references for your claims. The only possible explanation for which is that you CAN NOT. You are therefore a despicable fraud. Fortunately, an utterly transparent, despicable fraud. BTW. I KNOW about ALL the recent discoveries that you VAGUELY make reference to in your rambling nonsense and, almost certainly, many more besides. However, NONE of them are significant on the scale I outlined above and neither is all of of them combined. So, if you truly want to talk science, give a reference (or two, or....) that proves me wrong! GO ON, I DARE YOU TO TRY. Unless you do I am going to start ignoring you again. And you again read with confirmation bias, DS. They still treat/assume 'voids' are only 20% density compared to overall universal space. They still assume that matter has been traveling towards the 'walls/filaments' for BILLIONS of years; they still assume Big Bang scenarios and all the naive estimates from the OLD and increasingly being falsified hypotheses re EXOTIC DM and DE and all the misleading interpretations as to motions and densities/distributions. See? Your own reference shows just how BIASED and NAIVE and UNREAL the 'exercises' are. Get up to date. PLEASE!!! For everybody's sake please, stop this BS. You are convincing no-one and we are ALL bored with it. How can you stand there pretending you are up to date with ALL mainstream has been discovering/reviewing and confirming me correct in all along? You and your 'gang' buddies BOAST about NOT READING the facts, before you open your mouths and just regurgitate/defend OLD beliefs created when naive/simplistic 'models' and interpretations of observations was rampant. You ignore then deny. You have been infected by the STUMP METHOD for NOT getting informed. You keep insulting and accusing me of whatever, but fail to realize it's you being NOT UP TO DATE. And I am not here to wipe your nose and clean up your troll-shite. You and your gang buddies have been assiduously avoiding reading new info while insulting me. Too bad. Your problem. Don't come crying for me to go back through years of posts/mainstream discovery/reviews you intentionally/biasedly MISSED/IGNORED the implications/falsifications for OLD 'naive and unreal' BB (Including INFLATION), DE, Exotic DM etc. Read up. What the hell do REFERENCES have to do with anything? The only references you ever post are from one BIAS to the next BIAS, and mostly never anything about science, just your funny farm pseudo-science fantasies of cosmic fairy dust. Enter inventor of 'Stump Method for Ignoring, Denying, Insulting'! And totally irrelevant/hostile to polite, objective science/logics discourse without bias or ego-tripping malice. Note he NO LONGER denies the BOT-voting to unconscionably 'skew' ratings metric on a science site; and to 'hide' his 'enemy's' posts from mid-set reading filter. He is afraid that readers will see what he is trying to hide/deny. Ask yourselves, folks, what original and/or important work/insights has The Stump and his "TL;DR" Method offered science discourse here or any other science forum? That's right! None! He and his bot-voting, trolling gang buddies have been fouling these sites for years now with personal malice trolling and 'feuds'. Like the 'paddoboy' troll who sabotaged Sciforums for so long; until even his 'friends and protectors' among the mods/admin/gang could no longer deny paddoboy's poisonous, ignorant, baiting, trolling, sabotaging and 'framing-for-banning' tactics. Sad. Dudebro doesn't understand A = A, doesn't understand infinity, doesn't understand zero, and demonstrates complete innumeracy. Basically, when talking about science or math, @RC obviously doesn't understand either one and its capering and whining can be dismissed out of hand with little effort. @ Really-Skippy. How you are Cher? I am just fine and dandy, thanks for asking. I had to take 7 or 6 days off from the physorg, did you miss me? Hooyeei, I get back and look over what you been up to for the last week Cher. Not much new but you make up for not-original with the volume, eh? Anyhoo, all I wanted to say is I finally make it back. Oh yeah, also that you should be a little nicer to DaSchneib-Skippy and Whydening-Skippy. And the Captain-Skippy too. If it won't for them, you would not have anybody to fool around with when you come here. Everybody else has put you on the ignore. Or if they don't know you yet, they still don't get to see your deranged deludings because of the service I provide for peoples who set their karma slider over 2.0.. Try to be a little nicer because when they get you on ignore, then all you will have left is Ol-Ira-Skippy. Unless you just want to talk to your self, is that part of your mental conditions too? I can't believe no-one picked up on " and various 'energetic' states (protons, electrons, kaons, pions, quark-gluon plasma etc) "
Well, kaons and pions are shortlived decay products, lifetime of a few nanoseconds, hard to see how they could affect the mass deficit. Quark-gluon plasmas may be present at the core of neutron stars, but that would not change the behavior of the observed object. Electrons and protons? Pfft. Ira, you got a lot of reading, been busy he has. After all the years I been fooling around with Really-Skippy it don't really take too much time. He sorta HELPS me/you/us/them/him/her/everybody BY saying the SAME stuffs over and over and some more "OVERS". Hey @Ira, yeah, it's been interesting. I actually got @RC to be polite for almost a whole day. But of course the next day, back he slid. In the current conversation he's managed to lie about supposed "current research" on cosmic voids that no one else can see and he can't provide any links to, and provide convincing evidence that he's innumerate by not knowing that A = A, how infinity works, and denying the existence of zero. Pretty amusing stuff. The conversation has ranged across about five threads, and scattered amongst it you'll find some fairly interesting cosmology, if you can unwind it from @RC's capering and whining. where YOU equate abstract notions with reality; attempting to use the abstract convention A-A - 0, which does NOT reflect REALITY case, since UNIVERSE- UNIVERSE can NOT be 0 (ie, there is no such thing in reality as 'nothingness'). And it was ME got you to be 'polite' for a few posts until you ah=gain were LOSING the argument and resorted to insults and evasions which you are still persisting in despite you being wrong all along and me correct. Your 'convenient amnesia' is quick-acting now, making you 'forget' what you just erred in, again. Get up to speed. Learn. Well, kaons and pions are shortlived decay products, lifetime of a few nanoseconds, hard to see how they could affect the mass deficit. Quark-gluon plasmas may be present at the core of neutron stars, but that would not change the behavior of the observed object. You appear to 'believe' that there is no dynamical processes going on continuously across the universal space, Zerg. The whole gamut of 'products' is a fluxing states/densities etc PROCESS where those that have decayed/reformed are replenished by newly deconstructed/energized material. Is your theory a 'frozen universe', Zerg? You seem to have no idea what's actually happening across the deep space reaches through which all sorts of high energy radiation/cosmic rays are traveling and interacting to produce even ORGANIC molecules and dust/plasma etc. Learn, Zerg. There isn't any lying and twisting except yours. Stop making stuff up. It just won't work. Don't keep digging! Your hole of ignorance, re what is real/correct and what is not, is already big enough to bury yourself and that gang of bot-voting ignoramuses egging you on with admiring '5's. The problem is they have no clue and neither do you, DS. Your gang is about as useful to objective polite science/logics discourse here as a boil on Stumpy's rump. You have adopted Stump's 'method' for ignoring, denying insulting and lying so that you can remain ignorant and troll maliciously and ruin proper discourse. You should all be ashamed of yourselves, remaining intentionally ignorant by that STUMP 'method', instead of actually facing reality and using the scientific method. Take a break, DS. You need it to recover from this latest debacle by your own big ignorant insulting mouth. Learn. Take care. @RC, still you provide no links. It's obvious to anyone that you're lying. You made up a story about research that you can't provide a link to and no one else can find. There isn't anywhere to hide. There isn't any way to justify it. I'll be pointing to this thread from now on every time I see you posting here. You and 'the troll gang' boasted how you don't read what is posted and just proceed to deny and insult tactics. Now you try to blame me for your ignorance as to what has been posted for years now? @RC, you lied about current research, and when challenged you can't provide any links to it. It's over, @RC. There is no troll gang; there are a bunch of people who have watched you behave in the most immature fashion possible, whom you have repeatedly insulted, and repeatedly lied to and about, and they're tired of it. Yeah, "a bunch of people" who have been bot-voting and intentionally ignoring, then denying, and now crying for me to do for them what they should have been doing for themselves for years now. Recall the reaction from 'the gang' when I tried to caution about the Bicep2 crapola? No, you wouldn't because of your 'convenient amnesia'. Too bad. You have kept yourselves intentionally ignorant and attack the messenger (as per Stumpy's 'method' which you all have adopted in lieu of scientific method and human courtesy and respect). Your self-inflicted problem now. Go cry at the troll-moon which your "bunch of people" (who fell hook-line-and-sinker for Bicep2 crap and attacked me who was correct all along) has been baying at while ruining this site's and other site's discussions and feedback metrics. Shame on you and your nasty willfully ignorant and denialist "bunch". Stop digging, DS. I can see this is going to take a while. The new discoveries of ORDINARY matter in HUGE quantities EVERYWHERE and in all sorts of states and all sorts of scales/distributions, implies that NO 'dark Energy' OR 'exotic dark matter' are needed AT ALL to explain motions/lensings observed. You lied, @RC. You lied deliberately, you lied knowing you lied, you can't produce any links to the research you claimed, and you knew you couldn't when you did it. You lied to mislead, and you lied for your own self-aggrandizement. It is your habit to lie like this anytime you feel like it. No one should believe a thing you say, particularly not if evidence that proves some statement you've made wrong. So cynically it turns out that Super-Geologist John Michell, who in his lifetime got to know Joseph Priestly (oxygen) and Henry Cavendish (hydrogen), who both came up with their ideas of microscale-molecules, not only discovered the macro (g)-scale Hydrogen-Atom(today:Black Hole), but also made it possible that we get to discover this macro-Helium-Atom by stacking myriads of myriads of digital images on each other - two centuries later. We will certainly not be done with the quest for ellipsoidal (read:never round) constructs on n-fold diminishing rooted- and squared extremes of irreversible calculus orchestrated by random(read; anticipated) observations of coherence, as long as we can chase it. Well, at least you label him what he really is. A pop-sci author. "...The whole gamut of 'products' is a fluxing states/densities etc PROCESS where those that have decayed/reformed are replenished by newly deconstructed/energized material..."
"...all sorts of high energy radiation/cosmic rays are traveling and interacting to produce even ORGANIC molecules and dust/plasma etc..."
All of which we can see, and are accounted for. We're looking for stuff we can't see. "...Is your theory a 'frozen universe', Zerg?" all sorts of high energy radiation/cosmic rays are traveling and interacting to produce even ORGANIC molecules and dust/plasma etc. All of which we can see, and are accounted for. We're looking for stuff we can't see. Where have you been, Zerg? You missed all that Quantum Vacuum 'news'. And all the Polar-Jets/other energetic processes 'news' re injection of vast quantities over billions of years into deep space regions which some STILL mislabel as 'voids'. You also missed the 'news' re whole range of ionizing radiation forming the COSMIC BACKGROUND AVERAGE flux which, when not ionizing deep space material, causes said material to aggregate/dissociate/disintegrate etc. You seem so 'self-satisfied' there, Zerg; but careful, you seem to have missed a LOT while asleep! And all the Polar-Jets/other energetic processes 'news' re injection of vast quantities over billions of years into deep space regions which some STILL mislabel as 'voids'. Still lying about the voids, I see, @RC. Where are all these papers about "injections of vast quantities over billions of years?" And I thought you said they were being "mislabeled as 'voids.'" I don't see any of those papers, either; in fact, the papers that have been presented on voids accept them as fact, since they have the BOSS and SDSS-II to rely on for mapping of the voids. - prefers OLD 'faith-based' philosophical/metaphysical 'beliefs' in UNREAL Big Bang, Inflation, Expansion, exotic DM and Dark Energy, and eschews all opportunities to update himself re REALITY. You don't "see them" because you haven't actually looked to update yourself as I suggested for YEARS now. You and that 'gang' of bot-voting ignoramus parroting trolls just enjoyed 'bashing cranks' with your OLD beliefs while the mainstream astro/cosmo discoveries/reviews by mainstream went on....and you missed it all; which is why you now whine for me to link to it all. Too late. No time or inclination to do for you what you should have been doing for yourselves all these years (as I suggested when that Bicep2 crap came out...but you preferred to attack me and to 'bash cranks' instead of checking it all out objectively as I did). Listen, DS; you've only yourselves to blame for your intentionally cultivated ignorance while you spent your time 'parroting wiki', 'bashing cranks' using FLAWED 'work/science' which had been passed by a BROKEN 'peer review' system for DECADES. Stop blaming your victim, DS. Get yourself up to speed for yourself. well hell... i called that one right on the nose! Hi - I am new here and just want to get back to the original article for a moment. Since the 2 galaxies are interacting gravitationally it would seem to me that the space along their axis of interaction would be curved which could explain the gravitational lensing effects. I am a great fan of Alfven and once took courses from him a long time ago. I recall his web of magnetic fields linking the galaxies of the universe with plasma streaming along those lines. That plasma is mostly made up of electrons and protons which should radiate synchrotron energy as they move along the B lines. The problem is that none of that radiation is observed in those regions. Also while mass density and electromagnetic energy are equivalent from the perspective of warping spacetime, the kind of magnetic field energy density required to cause space distortions that lens galaxies would be like that around neutron stars and not the inter-galactic magnetic fields. Thank you for your on-topic post. A refreshing change which I and others interested in the science not the feuds appreciate sincerely. Yes, there would be some effects from the gravitational bridge/counteracting grav. fields, such as a region where the two fields balance to create a region of 'flatness' accentuated by comparison to the nearer-sources curvatures. Telescopes may not yet be sensitive enough to actually discern that synchrotron radiation from the overall BACKGROUND of synchro-radiation coming from all directions due to ubiquity of polar jets and other synchro-producing processes. That is also the problem in discerning the hypothesized 'primordial' CMB from the CMB produced NOW all over by on-going Polar-Jet, Black Hole and other extreme-redshifting processes/sources. Distant lensing 'images' are built up photon-by-photon; hence 'artifacts' are a real bugbear. "...You also missed the 'news' re whole range of ionizing radiation forming the COSMIC BACKGROUND AVERAGE flux which, when not ionizing deep space material, causes said material to aggregate/dissociate/disintegrate etc..."
Oh good grief, how is said ionization not seen? Why, if it has been seen, would it matter? It's part of the observable universe, a known quantity (within limits). Again, we're looking for stuff we can't see, the stuff that stops galaxies from flying apart like a catherine wheel. You also missed the 'news' re whole range of ionizing radiation forming the COSMIC BACKGROUND AVERAGE flux which, when not ionizing deep space material, causes said material to aggregate/dissociate/disintegrate etc. Oh good grief, how is said ionization not seen? Why, if it has been seen, would it matter? It's part of the observable universe, a known quantity (within limits). Again, ....the stuff that stops galaxies from flying apart like a catherine wheel. Pay closer attention to what mainstream astro/cosmo discovery/review is finding, Zerg. Past assumptions, interpretations, models, and 'explanations' based on same, now highly suspect....precisely because we ARE now 'seeing' NORMAL matter all over the place! And what we can 'see' is also misleading if not treated properly, ie naively based on simplistic/wrong 'beliefs', 'hypotheses'. The NORMAL GR and NORMAL MATTER/FORCES are OK; it was old/naive interpretations were flawed, created all the furphies. Ok? "...the kind of magnetic field energy density required to cause space distortions that lens galaxies would be like that around neutron stars..."
And they're quite small and hard to see, but yeah, that's the only place I can think of that would mag lens. Hmm, a rapidly rotating black hole? Would that field be intrinsic? My thought is - do the polar jet have sufficient escape velocity or are they gravitationally bound to their source galaxy? "...precisely because we ARE now 'seeing' NORMAL matter all over the place!..." No, we are not. We are seeing at higher resolutions what we had already seen. We used to say, "there is x amount of mass in y volume of space"
Now we can say "there is x amount of mass and it is distributed thus in y volume of space"
"My thought is - do the polar jet have sufficient escape velocity or are they gravitationally bound to their source galaxy?" That comment from you alone tells that you are not keeping abreast of mainstream discovery/reviews in this field. I cannot be expected to bring you up to speed on all of it. Do the research for yourself instead of repeating your beliefs as based on OLD info and assumptions that you already know about it all. You obviously don't, since the science literature 'papers' and PO articles are plentiful over recent years describing what you obviously missed. Try to look for yourself more thoroughly before again defaulting to old state of affairs. Thanks. There have been recent mainstream astro/cosmo papers describing how the polar-jets from active galactic nuclei can 'shoot' MATTER, in all kinds of states/quantities for epochs, out to far-distant deep space regions. Not to mention radiated energy of such polar-jet EM RADIATION PROCESSES can reach across 'observable' universe! Just as I'm sure other particulate in a jet stream does not and is subsequently drawn back in. @Zerg, it's important to note that no magnetic field has ever been observed to influence the paths of (uncharged) photons. One of the important things about photons and the EM force is that because photons are uncharged, they are not influenced by either the E or B fields. There can be no "mag lensing." As for whether polar jets have escape velocity, that varies by the jet. Even if they do, however, jets from galaxies inside a cosmic void are quite literally spit in the ocean, if even that. @Whyde, most of the hydrogen in intergalactic space is ionized (i.e., free protons). If it weren't we'd be able to see neutral hydrogen absorbing and re-emitting CMB. In fact, the re-ionization of this hydrogen was a detectable event in the history of the universe, and resulted in it becoming transparent as we see it today rather than opaque as it was in the distant past. It's the electrons that absorb photons, and ionized hydrogen doesn't have them. @astra, @Whyde and @Zerg are steering you the right way; I just made a couple comments to make sure you and they were aware of the edge cases. Carry on; you're getting good answers (and good questions where there aren't answers, which is, I think, equally important). Also you asked a good question so 5 stars for you. I understand that scientists can interpret data in different ways. I understand that scientists have preferred theories, especially when fundamental views are challenged by observational and experimental evidence no one has seen before. I understand that discussions of how new and old theories piece together new and old data can become heated at times. I do not understand how scientists can justify hurling insults at each other. I do not understand how scientists can substitute hatred of each other for discussions of how evidence fits into new and old theories. I do not understand how scientists can ignore evidence when they can't fit it into their preferred theoretical models. The cosmos is what it is. Evidence of how the cosmos works is all around us. Theories and simulations must be discarded or modified when new data won't fit. Argue using data. If you can't argue using data, remain silent until you can. A lyric from one of my favorite songs is, "When everyone's shouting, and no one is listening, how can we decide?" My point about magnetic fields affecting the paths of photons is just based on the equivalence of mass and energy with regards to distorting spacetime locally. So photons will follow geodesic paths on curved spacetime around regions of locally high energy/mass denisties and hence lensing is possible for regions of intense electromagnetic energy. My point about magnetic fields affecting the paths of photons is just based on the equivalence of mass and energy with regards to distorting spacetime locally. So photons will follow geodesic paths on curved spacetime around regions of locally high energy/mass densities and hence lensing is possible for regions of intense electromagnetic energy. It might be interesting to look for microlensing around magnetars whose masses are fairly well known. Then the additional lensing component beyond just mass could be attributed to the magnetic field energy density from GR which could then be compared to direct magnetic field determinations for these neutron stars. But there are so many assumptions that go into lensing calculations. Unfortunately all the types of energy we know about move at the speed of light, so finding them concentrated in one place so they can create lensing is pretty unlikely. It's pretty much only mass that does that sort of thing. Your idea about a magnetar is interesting, but I'd have to think about it for a while to see whether there might be a problem with it. I was not referring to electromagnetic energy which does propagate at the speed of light as you say. Rather I was referring to magnetic flux lines which are frozen in stellar plasmas and get wound up as the star spins to create local magnetic field energy densities that in some cases can achieve values which could distort spacetime locally around the star. The GR field equations use a local mass-energy tensor for spacetime curvature effects so these distortions that could affect lensing can derive from both mass and energy. Maybe the place to look for this effect is spinning magnetized black holes! I will look into that. Thanks for your comments. I thought about it a bit, and the problem is that a magnetic or electric field is not energy. How can you keep pretending to advise others when you eschew actually getting up to speed with the new/evolving mainstream discoveries/reviews on many fronts, DS? You deny what even recent mainstream papers/PO articles have reported on re polar jets ACTIVE for BILLIONS of years injecting humongous amounts of matter and energy into far distant reaches of intergalactic/inter-cluster space! This alone tells you are NOT FIT to judge/advise others about the REAL things going on; instead you keep regurgitating all the UNreal notions and naive assumptions in now-OLD orthodoxy. For science and humanity's sake, DS; pause your ego-tripping and gangmembers tactics, insults, denials etc, and get up to speed a.s.a.p. with mainstream developments recently/now/impending, ok? Then maybe you might be able to contribute something original/substantial to science discourse trying to ADVANCE astro/cosmo theory and knowledge BEYOND early naive/simplistic crap. Thanks. "@Zerg, it's important to note that no magnetic field has ever been observed to influence the paths of (uncharged) photons." Yeah, poor phrasing by me there. "Then maybe you might be able to contribute something original/substantial to science discourse trying to ADVANCE astro/cosmo theory and knowledge BEYOND early naive/simplistic crap. Thanks." What would be really great, is if you did the same. "For science and humanity's sake"
So, I have been correct and pointed out many things which neither you nor DS, nor the rest of your 'gang', knew, yet you still have the gall to pretend I am the one not pulling my weight re advancing science/humanity discourse? That is industrial strength 'in denial' trolling. insulting worthy of all 'graduates' from the STUMP ACADEMY teaching the (patent pending) STUMP METHOD for ignoring, denying, insulting and remaining willfully ignorant and malignant to the interests of science discourse! Zerg, you really must learn to read and comprehend without personal bias if you are to keep up with the info being shot at you by me/mainstream. Catch up! 5 "/"s for you, RC. Thanks. What are you implying, Whyde? The FACTS are as previously recorded by the posts in question: I have pointed out important MAINSTREAM (as well as mine) stuff he missed/denied while insulting and trolling. That sort of behavior self-identifies what he is not fit for in a science discussion re matters he does not know about despite his bashing those who do know and are up to date. Stop it. My tone was commensurate with his/gang's CONTINUING attacks despite me being correct and they incorrect. Why blame the victim, Whyde? Always - "I" did this or "I" said that. Not very "sciency. You are; a Prima Donna Princess attention Whore..
Why is everyone always pickin' on him? YOU stop it, Mr. "Victim". There is negative reason for personal attacks; they are worse than useless (stolen from a famous British broadcast SciFi series: credit due, credit given). Point at the data, not at each other. Why are so many of the posts nothing but attacks on other posters? I would think PhysOrg would prohibit that. They practically beg for negative response, so as to claim victimization. Point out their subtle attacks on the data. Their subtle attacks will then no longer be subtle, and your response will be viewed as very professional, even if it turns out to be wrong. In science, being wrong is no big deal if you're professional enough to admit it after all the data are considered. Even science "gods" have been wrong many times. It's embarrassing, but that's all it is; it's not unprofessional. It is, for all practical purposes, impossible to get loud and angry people to admit they are wrong, so don't even try. Those professional enough to be swayed by data driven arguments will pay attention to you and ignore the shouting. At what point does it GAIN them? I mean, what does it take to get a proton and an electron together..? No-one is attacking the DATA, Whyde. It is what it is. It is the Interpretations and Assumptions employed in 'analysis' and conclusions of/from that DATA, that is the problem. So, Whyde you/the 'gang' should attack the objective arguments made by those pointing out those problems; instead you/they keep attacking the messenger who points out those things. Recall what happened when I was 'the messenger' in Bicep2 fiasco! So please, Whyde, stop blaming the victim of continuing scurrilous, undignified, unscientific, trolling/bot-voting attacks from you/gang who fell hook-line-and-sinker for that BAD 'science' which I tried to warn you about ok? OH, in case you missed it: it's YOU/THEY who keep making it all about the person (ie, me,your victim) instead of the science/logics issues I pointed out. It perfectly illustrates all I have been trying to warn you/gang about all these years; re using simplistic assumptions/maths without proper regard to the reality being 'analyzed' so naively and misleading a manner. Do you understand the subtle arguments against RNP's "model and methodology" involved in his approach to the two regions (galaxy and Solar System), Whyde? And how his approach is fatally flawed from the outset; and why? Think about it all, without bias or kneejerk based on personal animosities, ok? Then see all the many obvious logical/reality non-sequiturs/unreal modeling/analysis etc employed by the 'exotic' DM proponents/theorists/calculators etc. Thanks, Whyde. Why don't the "gang of trolls" 1 me? I don't say " Now you see I've been correct all along..."
BTW, If you noticed (you didn't), I did not fall hook, line and sinker for Bicep2. As for 'presentation' being the bot-voting 'criteria', Whyde, you and I know full well it is personal animosity against me for exposing/correcting that longstanding gang of trolls/bot-voters sabotaging for YEARS. You are 'safe'; as you haven't been correcting/exposing them at all, let alone for years now, hey? You've got the 'in' with that 'gang' and your past chats and condoning/approving of their bot-voting malignancy has made you a 'preferred-Skippy' (until now maybe!). Recall a decade long history. These are the same/affiliated bot-voting, sabotaging 'gang' of trolls who brought the 'poisonous tone and personal feuds' to OLD physorg-physforum! And they destroyed the site, with the connivance of the MOD(s); with whom they COLLUDED to frame and ban those not cow-towing to their WRONG beliefs in WRONG orthodoxies. Anyone who even tried to start polite, logical, scientific discussion on the issues would get sabotaged, baited, trolled and eventually banned! This happened at Sciforums recently too. There it was the "Trout" and more lately the "paddoboy" trolls who colluded with admin/mods to ban anyone showing any tendency towards objectivity and politeness wanting to discuss logics/science not persons. Paddoboy/Trout gone now; even their colluding mods/friends had a gutfull of their poisonous games. And you know what happened to OLD physorg-physforum! So, Whyde, you TOO might have been 'the victim' if you'd been in MY shoes! Ok? Didn't you? Great! Well done! Which is why it has been so perplexing and disappointing to see you since that episode continuing to support, encourage and otherwise condone actively, and via your 'silence', during their CONTINUING ungentlemanly, unscientific and unfair attacks on the messenger who tried to warn them to check it out objectively for themselves.....with the result that since March 2014 I have been stalked, trolled, bot-voted against even when I have been correct on science and behavior, and baited into responding to their incessant 'gang' trolling etc attacks. If you are now more independent of the poisonous influence of that 'gang', then I can only commend you! Kudos, Whyde; and more power to your intellect! Thanks. Just - shut up, RC. Converse, not lecture, you idiot. So telling it like it is makes you feel like you're being 'lectured' to? And your responses are now such, that, "conversing", appears to mean (to you) that you are free to insult/mistake and I cannot correct or disagree (or even agree) with you! Seems a somewhat arbitrary constraint; if not a downright 'double standard', Whyde. Maybe you should calm down and follow your own "shut up"; and then maybe actually "converse" instead of insulting/mistaking all over the place like an inebriated trolling, bot-voting, 'gang' member, hey? It would make a nice, quiet, change. Thanks. So telling it like it is makes you feel like you're being 'lectured' to? And your responses are now such, that, "conversing", appears to mean (to you) that you are free to insult/mistake and I cannot correct or disagree (or even agree) with you! ... then maybe actually "converse" instead of insulting/mistaking all over the place like an inebriated trolling, bot-voting, 'gang' member, hey? It would make a nice, quiet, change. Thanks. YOU don't converse. you excoriate. And you don't even realize you're doing it. Then why are you trying to simplify it even further? No, I don't. I see it as a matter of scale, in which RNP has a reasonable grasp of. What your missing is the variable relevance of forces at different scales. YOU don't converse. you excoriate. Your 'opinion' of me is like ISIS's 'opinion' of USA: a tad biased, hey? Face/tell the reality as it is, Whyde; the ONLY posters I come close to "excoriating" (ie, responding proportionately and 'in kind', by exposing, condemning their anti-science method/discourse behavior on a SCIENCE site! ); justified by their years long record of self-demonstrated trolling, bot-voting 'gang' members who persist in unwarranted personal stalking and attacks on me, based on their own sick agendas, and their embarrassment at being shown up for what they have been for far too long now. As for the rest, please note my username, "RealityCheck": that will give you a clue why I post the occasional important and timely REMINDERS and CAUTIONS (to ALL 'sides') based on known science and more up to date mainstream/my insights...in the interests of BALANCED, impartial/objective, polite science/humanity discourse. What have YOU/gang been doing, Whyde? How so? Is pointing out glaringly flawed assumptions, methodologies, models and claims, now falling foul of your own personal definitions/usages? So, you don't understand; and you haven't asked for clarification so that your understanding can be properly got; but resorted anyway to kneejerk reading/response, based on your OWN miscontruing of context/subtleties in this matter. Whyde, the STUMP 'method' for ignoring, denying, insulting, remaining ignorant of actual context/issue, is NOT HELPING your understanding. I see it as a matter of scale, in which RNP has a reasonable grasp of. The SPECIFIC context/issues involved are NOT in that category in this case. Read. Ok? Wow. So many idiots. So few explanations. Surprise, surprise. Get them to do the maths of gravitational lensing, and they implode. "can;t happen, doesn't happen", et boring cetera. The one thing in common with all these fruitloops is that they are a) unqualified, and b) haven't got a bleeding clue about the subject matter. Never is a scientifically sensible alternative option proposed. Ever. Essentially, we are just dealing with gobsh**tes, who have zero scientific qualifications, nor, indeed, a bleeding clue about what they are talking. And so it goes on. The usual idiots. The usual BS. Never making the tiniest dent on scientific thinking. Ever wondered why, cranks? Because you haven't the faintest idea what you are talking about. Yes? Does that not trouble you, with your upper 4th form art merit? Get a frigging life. Is pointing out glaringly flawed assumptions, methodologies, models and claims, now falling foul of your own personal definitions/usages? The intergalactic medium's hydrogen is mostly ionized still, so the answer for it would be "never." What I meant was - under what conditions does a proton lose ion status and gain (or regain) an electron? ... ; the ONLY posters I come close to "excoriating" (ie, responding proportionately and 'in kind', by exposing, condemning their anti-science method/discourse behavior on a SCIENCE site! ); justified by their years long record of self-demonstrated trolling, bot-voting 'gang' members who persist in unwarranted personal stalking and attacks on me, based on their own sick agendas, and their embarrassment at being shown up for what they have been for far too long now. Your doing it gain and don't even realize it. ... in the interests of BALANCED, impartial/objective, polite science/humanity discourse. The universe(and everything in it) works because it is UN-balanced. More like USA's opinion of ISIS. I guarantee no one is stalking you. You just "drop in" and make sweeping, grand pronouncements. based on their own sick agendas, and their embarrassment at being shown up for what they have been for far too long now. Paranoid much? Totally subjective opine, again. Only because YOU keep "doing it again and don't even realize it", Whyde; else I wouldn't have had to respond accordingly at all. universe(and everything in it) works because it is UN-balanced. Sure. I have been pointing out 'imbalances' at infinitesimal quantum-to-largest-emergent scales. But science discussion requires objectivity/balance; else trolls win. Sure. I've long pointed out 'imbalances' at infinitesimal-quantum-to-largest-emergent-scales. But science discussion requires objectivity/balance; else trolls win. Ok? Oops. Double post instead of Edit. Apologies. Anytime there's one around. Nothing special is required, they're attracted to one another. That would mean - very few electrons in space to bind to the free protons (if said proton is holding any positive charge at all), or there is a proximity limit that must be met., right? In space conditions there are natural, practically ubiquitous, variously scaled, 'sorting mechanism' for charged particles which separates negative from positive charged particles into 'current streams and sheets' that may extend for large distances. You can easily confirm that by referring to literature on magnetic field effects across space. Even our very own Earth's magnetic field pattern 'sorts' incoming electrons/protons and other charged particles, so they eventually end up striking our planet at different (North or South) poles according to 'charge'. Some people's simplistic 'picture' that charged particles 'always attracted to oppositely charged particles' may not reflect all the rich 'intermediate' features/dynamics which can arise across 'magnetic field-conditioned' space between 'sources and sinks'. PS: Also, a strong gravitational field can 'sort' according to energy/speed/mass of light/heavier charged particles' ability to 'escape' it. Cheers. And very few protons as well. Can you express that with your REAL maths, please? Those things I pointed to are ALL EMPIRICAL observables/processes, Whyde. If you can't grasp empirical evidence according to its physical obviousness, then 'maths' (of any kind) won't help you! I suspect you had 'tongue in cheek' when asking that. In any case, read up on subject matter in question to see the KNOWN science I reminded of. @RC is lying again. Now, when challenged to provide some sort of alternative math it claims to have discovered, it changes the subject to vague "EMPIRICAL[sic] observables/processes" (whatever that's supposed to mean) in order to avoid admitting there is no alternative math and never was and never will be. What are you going on about now, DS? Obviously, if the phenomenon I spoke of is readily observed and examined closely in any lab; and if same phenomenon is now confirmed by mainstream to occur in space, just as I described to Whyde; then that should suffice to comprehend that the phenomenon as described exists and so do its 'charge sorting' effects which, again, can be easily observed with Earth's magnetic field and the polar aurora resulting from the 'sorted charges' impinging on the atmosphere at Earth's magnetic North and South poles according to the charges involved. In that context, Whyde's 'maths' request was 'tongue in cheek'; not needed to understand the empirical evidence/phenomena described insofar as its 'sorting' action is concerned. PS: Your gratuitous insults, trolling 'campaign', aren't helping your 'image' or your 'objectivity'. Please just drop them, DS. Ta. @RC, still waiting for the alternative math you claim to have invented. DS, you have just again tacitly admitted you are not aware of the magnetic fields and their 'charge sorting' behavior in lab or space, things which all real physicists know well and are increasingly studying even as we speak. What does that do to your 'scientific/logical' integrity/credibility, DS? And DS, you keep accusing me of lying; despite your boast that you don't read what I posted and do not keep abreast of recent astro/cosmo discoveries/reviews by mainstream which increasingly making old naive/simplistic/unreal BB/Inflation/Expansion/CMB etc 'myths based' claims and assumptions/interpretations obsolete. How much more damage does that do to your 'scientific/logical' integrity/credibility, DS? Learn, DS. Stop trolling and insulting like a maniac on the internet, DS. And stop digging! @RC, still waiting for the alternative math you claim to have invented. Charge sorting is an obvious and well-known phenomenon; and it is a feature of both magnetic and electric fields, taught in early courses in Electronics Engineering, as well as the physics of the EM field. Thanks for agreeing with what I posted to Whyde on that. Which now raises the question: Why did you attack when I pointed out to Whyde that all that stuff was empirically well known already? @RC, math is already based in reality. The points about apples show it. Pretending it's not is another lie. As far as basic charge sorting, that's already well known and not at all similar to your representation of it, which is also a lie. Finally, no one is "attacking" you. You're merely being forced to confront your dishonesty, and like most dishonest people you don't like it much. math is already based in reality. The points about apples show it. Pretending it's not is another lie. What the dickens are you on about now, DS? My relevant post(s) to Whyde were perfectly consistent, both in context and content, with the subject matter and known science. So WHY OH WHY do you 'need' you keep trying to twist things out of all objective shape like that, DS? Oh, right. So you can pretend to 'correct' someone who was ALREADY fully correct all along, that's why! DS, do you even stop to realize how lame and pathetic, not to mention disrespectful to all science method/discourse principles, you are being? @RC, I don't respect liars, so I don't respect you, and I won't unless you stop lying. If you want respect, earn it. [Those things I pointed to are ALL EMPIRICAL observables/processes, Whyde. If you can't grasp empirical evidence according to its physical obviousness, then 'maths' (of any kind) won't help you! Too late, since I do almost all of my science "catching up" on Phys.org, I'm as well read as you. And how did we get sidetracked out of the topic, again? Empirical in words (your chosen medium). All brought to you by empirical mathematics to "model" those "observables/processes".. Careful not to conflate the map with the territory, Whyde. All good mathematicians and good physicists know where to draw the line. The directly observable phenomena evidences that phenomena empirically when you actually directly test its existence and properties etc (ie, the territory) The mathematical representation OF that empirically observed phenomena is abstraction (ie, the map/model). Ok? Good to hear! The questin then is: are you as comprehensively equipped in the science/logics and longstanding knowledge/insights-base as I have been in order to 'connect all the disparate dots' into one 'whole big physical picture' consistent and complete reality-based ToE/Maths construct? RC, why are attacking the people instead of the science? Why are so fanatically opposed to the existence of dark matter? I also look at the data, and every time I do, I see dark matter. Your diatribes against dark matter began long I joined this commentary halo (I couldn't resist, and I'm not the least itty bitty tad bit sorry), so I don't know the bases of your arguments — how, when, and why your vomit inducing distaste for the stuff (dark matter) got started. Because it doesn't have any facts to support its lies and it has no other response. The only useful reply is to continue to point out its lies, over and over and over again. It's a shame you oppose this; I was not impressed with your prior comments on this thread so far. I'm glad you seem to be figuring out that not all those who oppose liars by pointing out their lies are somehow problematic, but suspect that you will not reply to me supporting this pro-science agenda since you appear to be more interested in whether people are polite than in whether they are correct and dealing as best they can with liars and provocateurs. Impress me and consider reality rather than appearances. @RC, I am not ignorant, and I am not hasty. You are lying regularly, and descending to various strategems involving insults, condescension, whining, unsupportable accusations for which you present no evidence, claiming non-existent scholarly papers, obfuscation, misused philosophy, and every other prevarication you can come up with. As long as you continue on this course, you will eventually sour the perceptions of anyone reasonable who reads your trolling. In short, stop lying, @RC. Cheaters never prosper. Da Schneib, it's not you I'm complaining about; it's RealityCheck. You are being civil — there's nothing wrong with calling someone a liar when that someone is a liar, and you have more than enough proof that RC is lying — my sixteen year old daughter knows enough to recognize that he's lying. It is RC's venomous foaming at the mouth that bothers me, and I can't figure out why he has problems with dark matter when all he ever does is shout incoherently, appearing to believe he's Galileo, Einstein, and Hawking, all rolled into one. All I've been trying to do is get him calmed down enough to state his case without spattering everyone with his saliva and stomach acid. I simply don't like fighting; I killed a great many people in my youth, and I'm trying to do penance (I was a so-called super soldier for several years — Green Beret Special Forces, SEAL). I'm sorry I caused myself to be misunderstood. The reality is: I AM the one who has been attacked unprovoked by trolls/ego-trippers motivated from by own scientific ignorance and/or personal malice. I would so-call that a Skippy-super-duper soldier. (Since it takes several years to get to be one or the other.) How you do that? Serve in the Army for enough years to be a Green Beret, and after you got out you decided you would join the Navy/Marines just to see if those Seals is as tuff as they claim to be? @randomcyborg, thank you and well said, sir. I'll keep that in mind from now on. My apologies to you for the misunderstanding as well. @RC, you're lying again. This is another of your standard maneuvers: trying to inject FUD into science. I won't bother adding this thread to the list... yet. But I suggest you note that your frantic maneuvering is apparently clear to just about anyone, and amend your behavior. Your cred is very weak. @Ira, my friend, that was a handsome apology and I for one have no intention of looking a gift horse in the mouth. I can think of good reasons to believe that such a claim might be obfuscated and I'm sure you can too. I have no intention of pressing someone who has potentially had experiences they cannot share on an open forum like this one, particularly not when they behave rationally. Food for thought. There are claims to press, and claims not to press, and I evaluate this one as one not to press. I don't say not to be cautious, but we'll have plenty of time to evaluate this over time, and the truth will out. I'll let this lay. UI, the Navy asked me to join and undergo SEAL training. That, however, is neither here nor there; I was explaining why I don't like fighting, nothing more. I have the rank of yondan in one style of karate, godan in another. I love and have taught knife fighting (but, since I left the military because of combat injuries, only as sport). I've sailed around the Ring of Fire in a 70' waterline double masted schooner. I'm a private pilot with a commercial certificate. I have three doctorates, all earned (mathematics, psychology, computer science). I've been a professional musician, and did studio work as well as back up stage work. My "claimed 'sixteen year old daughter'" is my sixteen year old daughter, who has an eidetic memory and an IQ of about 200. RC, you have yet to answer my question; you're still spewing vomit without telling me what you ate. So far, mate, the only vomit being spewed (about me) is by you and DS. Why bother to get involved in a longstanding situation involving long campaign waged by the troll/bot-voting gang here which is pissed off because I do reality checks on their comments/claims as well as those from their supposed enemies. I have been trying to get all 'sides' to eschew personal feuds and insults and trolling/bot-voting tactics etc which only clutter and bury the science discussions in gang-troll-shite and poison the waters for everybody. ASK Da Schneib to confess who was it that didn't know about PLASMOIDS and FLUX TUBE PROCESSES going on in the SUN's photosphere etc; and who was it that had to point out the known science that they DO go on there. It's become DS/gangs signature MO: LIES BY OMISSION. RC, I started out, lo! these many posts ago, by asking nicely, and kept trying to ask nicely, but you have never answered me with anything except venom. I would like to know what the original... disagreement was about. That's all. Uncle Ira, after re-reading what I wrote to you, it is clear that I owe you an apology. I fully understand why someone would be skeptical regarding my statements about myself. I was pissed off at RC, and I took no precautions to make sure no one else was hit. I neither lie nor exaggerate when telling someone about myself, but there's no way you could have known that. I know from experience that most people have trouble, initially, believing many of the things I tell them about the life I've led. I was wrong to criticize you, and doubly wrong to criticize you so rudely. Your misunderstandings even in such simple matters between you/DS/Ira, demonstrates how easy it is to 'get hold of the wrong end of the stick' if not fully informed as to ALL the facts before jumping into the middle of YEARS of 'internet gang' bot-voting/trolling/attacking etc activity here/in other forums. Regarding the exchanges between me and the usual 'gang of trolls here', there is NO 'one original disagreement', It's about the longstanding campaign by them to sabotage, clutter, bury and skew both the discussion and the rating metrics on a science site. That is UNFORGIVABLE on any level, because it goes against all good science/humanity discourse ethics. That's why I've been asking. Duh. And you're still not answering. What big bang and inflation "myths"? Which recent mainstream discoveries? What are your new mathematics? Such things are not derived in a vacuum (unless the developer is outside the atmosphere); novel applications, perhaps, but not entirely new mathematics. I was doing just that for several years, and it wasn't easy — it took letters, emails, visits, and colleagues. Are you going to keep putting off answering forever, just to save face? You wouldn't be the first. It's many years long situation/story, as I already pointed out. How long have you got for a proper briefing which would be required now if you are to NOT get the wrong end of the stick on that too? I haven't the time. I already pointed out Penrose admitted BB is NOT and never was a REAL 'beginning' for the universe, but a mere arbitrary notion. And Steinhardt admitted INFLATION bogus too. They were pointed out/discussed in the relevant PO threads on the matters in question. If you missed it all, then I haven't the time/inclination to do the work for you/others not fully appraised of the background so far. The failure/inadequacy of conventional 'unreal' axioms/maths I have long pointed out, more recently again discussed/highlighted in exchanges with DS/Zerg, makes it incapable of modeling Universal Reality. My novel reality-based axioms/maths work aims to make maths capable of modeling reality-based ToE. Well all that is interesting to know about. Do you know a guy named glam-Skippy? You should meet him, you two have a lot to talk about. Uncle Ira, I do not know glam-Skippy, not even by his real name. I do, however, know the very first SEAL. He was in the first group to graduate the Navy training course in WWII, before they were called SEALS (they were UDTs, then); I'm not going to name him. He's the last one of that group still alive. He's 97 years old (30 years my senior), and his mind is almost gone due to Alzheimer's. Every now and then he knows me. I miss him — we always had lots to talk about. I have the opposite problem: I can't forget anything, and everyone thinks I'm 40 (although I need a cane to walk any farther than across the room — combat injuries). Well that is really good stuff to know. Nobody thinks I am 40. I will be next year though and Mrs-Ira-Skippette will probably still accuse me of not acting my age. Non, I am just a regular Skippy. But I do have a question me. I've never acted my age; I've found that has a rather soothing effect when that is needed the most. I should mention the 70' waterline schooner was my friend's, not mine. My wife and I spent four wonderful months on it. My friend was afraid of flying, so my wife and I couldn't take him up. I can't tell if, by referring to yourself as a "Skippy", you're disparaging yourself (if so, don't let your wife see your post), stating you're a guy to be with when when things get dodgy ("Dodge" is what I've been called all my life; I didn't learn my real given name until I was age five), were in the Navy (SEALS are tougher, those who wear the Green Beret are smarter; but not by much, either way), or that you're from a part of the world where the Southern Cross is visible (I have a few friends who are Ozzies; one turned out to be a Nazgul). I should mention the 70' waterline schooner was my friend's, not mine. You can mention him if you want, why ask me? Too late for that, Mrs-Ira-Skippette sees a lot of the stuffs I posts. And has big fun with me about it too. Non I am not stating that. I call everybody Skippy, even me, and Mrs-Ira-Skippette, and everybody. It's like "dude", or "guy", or "mate", or "podna". I hope you are not accusing me of what it sounds like you are, if you are it might be time to live up to your name and try to "Dodge" me from here on out. Why does everybody always assume the worse about the Cajun? You watch to many cartoons, eh? Uncle Ira, I most definitely was not accusing you of anything bad, wrong, illegal, immoral, unethical, distasteful, dishonorable, unpleasant, or, in fact, anything at all. I was just asking in a roundabout way, as is my wont. Dodge is from "roger dodger" — my dad was an ATC. I like people; I'm also a psychologist, remember? That you are Cajun explains your use of "non". I should have realized; I grew up near Cajun country. I mentioned my friend and his boat because I didn't want anyone to think I was rich. My wife and I were well off, but not enough to have a 70' waterline double masted schooner. We had a 26' deep keel cutter sloop (perfect for offshore) and a twin engine airplane that cruised at 200kts (my wife was also a licensed private pilot, but was killed by a terrorist while pregnant with our first child; I earned three doctorates to try to forget, but it didn't work), but a double masted schooner was extremely outside our price range. Uncle Ira, you may think me stupid, or even dishonest, for asking the following questions, but they are honest and genuine. Is there prejudice or bigotry, or both, against Cajuns? If there is, I've never been aware of it. If you can tell me within the constraints placed on language by this message board, please tell me what you thought I might have been accusing you of doing or being. I honestly do not know.